"Happy Thursday! Here's our line up for today : 1. Georgetown (Thomas Jefferson & K NW) 2. L'Enfant Plaza (7th & Mar... https://t.co/SXbN97PGi4"
Hands down one of the best food trucks in the city! Shrimp and Lobster rolls are amazing and the Lobster Mac is just what you get, plenty of gooey cheese and plump pieces of lobster. My sandwich had primarily the tips of the lobster claws and hardly any meat. I did not discover this until I was all the way back at my desk but for the money spent, I walked all the way back across town and requested a refund after the guy told me it was fine to eat. In all the times I've ordered lobster (from other places of course) Ive never been just served the rubbery tips of the claws. No thanks! I wasn't impressed with the lobster roll. It wasn't warm and it lacked flavor. I give them two stars for decent customer service. First time I was here and it was FANTASTIC! I completely understood the long line, as there was so much lobster on the roll it was falling off! The Ginger mint tea was also awesome! Tried this for the first time last Friday at L'Enfant; got the lobster roll and clam chowder. Both were excellent. Lobster rolls are small by definition, particularly if served on the right bread (as this is; it resembles a hot dog bun with a squared off bottom). It's the real deal, even if a bit pricey. The lobster mac was great. They did not skimp on the lobster. I was amazed at how much lobster was there. Great Service!!! There were only 3 little pieces of lobster in a tiny round container only filled 2/3 with undercooked hard noodles and lukewarm sauce. I would not recommend this place to anyone. I love the fresh taste of the lobster chunks and the buttery roll. Couldn't really taste the difference between Ct and Maine. Ginger mint Limeade was devine. Too expensive for such a small portion. I will probably visit again once every 6 months. Food was good, but for the price you don't get much. 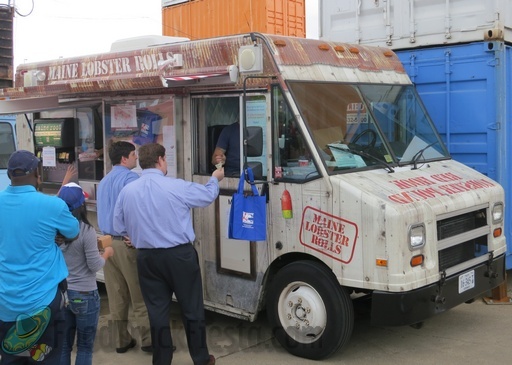 The lines for this truck are usually the longest to get through when they are in Tysons so I was left completely underwhelmed by my lobster roll after waiting forever to get it. I was also excited to try some different drink options, but the soda fountain was broken. How Much Did It Cost? : $15 approx. There was a sign next to the order area that showed a special: Shrimp Roll with bacon and avocado. 3 of my very favorite things! Man, was I excited. When I walked up to order, I nodded to the sign and asked if they still had the shrimp roll. I was told yes. When I got back to my office, I found it was only shrimp salad. Very disappointing.I definitely didn't make myself clear, but if you've got a special that is very similar to a regular item, it would be helpful if the person taking the order would confirm. Also, the pickle, which I usually like very much had a very bad taste. I love your truck, but definitely had a bad day today... I'll be back. 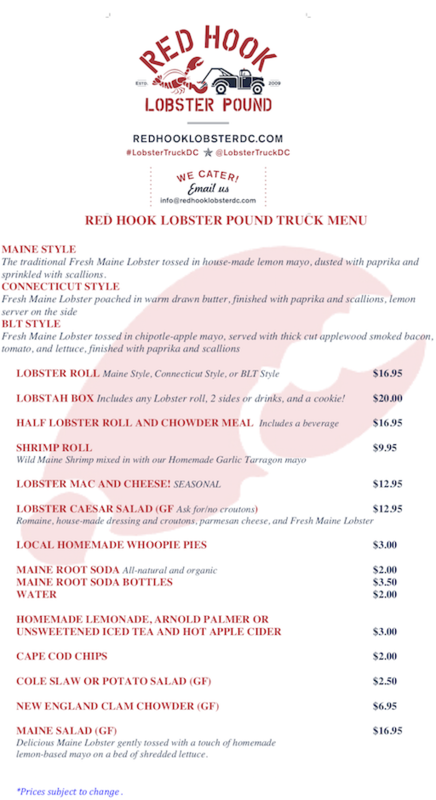 Rising to huge popularity in just a little under two months, the Red Hook Lobster Pound food truck made a huge splash in the DC food truck scene. It now tops the charts in food trucks with the most Twitter followers (as of Oct 10, 2010). Also known as DC’s Lobster Truck, this food truck has a simple menu of lobster rolls and shrimp rolls. The lobster rolls are served as Maine-style (mayo-based) by default, but can also be ordered as Connecticut-style (butter-drizzled). Red Hook Lobster Pound innovated in the food truck scene by having the first fountain soda dispenser integrated into the side of the food truck, serving Maine Root soda. Pro-tip: Line up for the truck before they arrive on location. Once the truck parks, insanely long lines start to form. The lobster truck is permitted in DC, Arlington, Montgomery County and Fairfax County. On April 30th, 2011, Red Hook launched their second DC food truck, named Lobby 2.